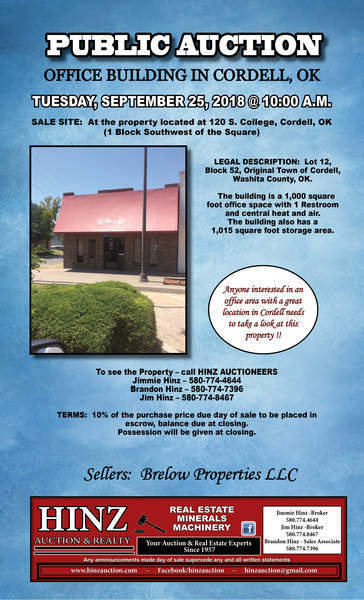 TUESDAY, SEPTEMBER 25, 2018 @ 10:00 A.M.
LEGAL DESCRIPTION: Lot 12, Block 52, Original Town of Cordell, Washita County, OK. The building is a 1,000 square foot office space with 1 Restroom and central heat and air. The building also has a 1,015 square foot storage area. to take a look at this property !! Possession will be given at closing.